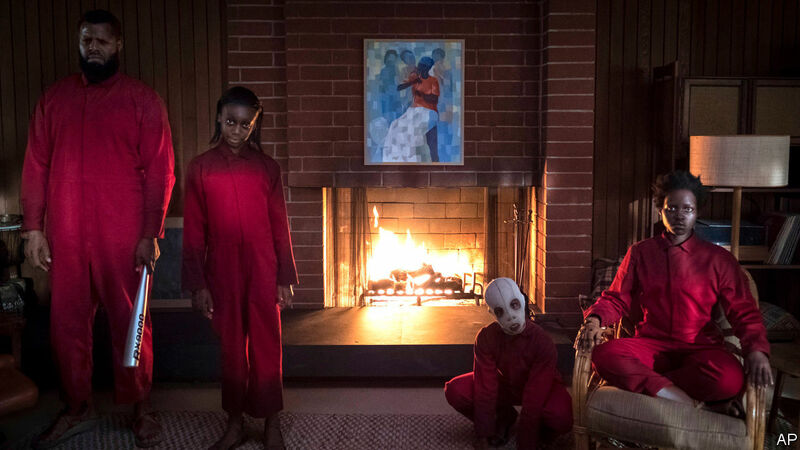 Us (2019) is the newest original horror from Jordan Peele, who won an Oscar last year for his success hit Get Out. This horror film is a completely different story, in which there is a world in which there are doppelgängers who live underneath. All of the main cast, including Lupita Nyong'o and Winston Duke, are having to play two characters, which include their regular characters as well as their evil doppelgängers version. I will not say any more about the plot, as the best way to watch this film is to go in as blind as possible. I had very high expectations for this film, coming off from the success of Get Out. Get Out was one of my favourite films of 2017, so I knew the type of storytelling that Jordan Peele can pull off. He has once again succeeded in this by creating a world that feels so dark and haunting, yet so real and grounded. The film may feel slow at times, but it is just building up this tension that never vanishes, even when you leave the cinema. He starts the film off with a fantastic opening sequence which is vital to the story, as well as a visually stunning ending that will give you chills down your back. With such a dramatic story, you need the best actors and actresses to play these roles, and the entire family is superb. 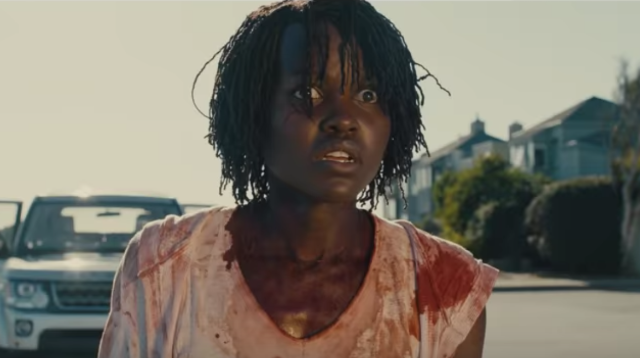 Lupita Nyong'o is the true star of the show, and I seriously hope the Academy pay attention to her, unlike with Toni Collette in Hereditary (who still gave the best performance of 2018). Lupita's performances as two very different characters is in my top two favourite performances of the year, and my favourite so far from any actress. The rest of the cast also do a fantastic job, with Winston Duke providing a great sense of humour to compliment the horror sequences. The kid actors who play Zora and Jason also have to play two roles, and their doppelgängers were truly terrifying. This film is described as being a true horror film, and it certainly feels like it has been inspired by that. There are senses of the 1980s horror films with the slasher aspects as well as influence from the home invasion movies. Whilst I personally wasn't screaming or falling out of my chair with this film, I appreciated all of the horror aspects in the film and it was more of a chilling horror. I still do not fully understand all of the imagery in the film, but it is very creepy nonetheless. 2019 may just be the year of rabbit imagery, with The Favourite and now Us. Whilst this film felt like a simpler story and fewer characters to work with, it ended up being a lot more detailed and questionable than Get Out was. With Get Out, Peele created a complete story to start to finish, and every question was answered within that single film. With this film though, there are so many unanswered questions and plot twists thrown that left me needing more answers. I cannot wait to go back and check this film out again on Wednesday, as I feel like there are aspects that I missed out on the first viewing. Whilst Get Out feels like the more complete film, this is the film that I want to explore more of and find out all of its secrets. This film demands to be watched over and over again. There are so many references and little moments that build up, and you will certainly not be able to catch them all in your first sighting. Peele has declared himself a master of filmmaking here, knowing exactly what techniques and style he needs to use to pull something of this scale off. It is safe to say that Jordan Peele is truly becoming a master of his craft, and that is with only two directorial films under his belt. He truly understands the concept of filmmaking and how to make a simple plot drive a two-hour film by creating fleshed out characters, use creepy imagery and create a new twisted world for us all to enter. Whilst I found Get Out to be the more thrilling, cohesive and entertaining film, there is so much more development and craft put into Us and I know that when I go and check it out again, it could very much get that perfect score for me just like Get Out did. Have you seen Us yet? If you have, what did you make of it? And if you haven't, have the great reviews persuaded you to check it out soon? Let me know all of your thoughts in the comments below.